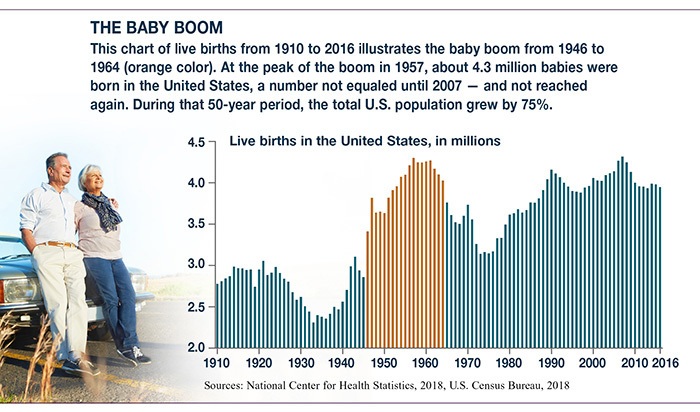 The baby boom generation was the largest and longest birth bonanza in U.S. history, extending 18 years from 1946 to 1964.1 With that wide spread, it’s natural that older baby boomers might have different feelings and experiences regarding retirement than younger boomers. A recent survey highlights this disparity and raises important questions for those who are still in the workforce. However, there are some fundamental differences in financial experiences on the two ends of the boomer generation that are worth considering. Declining pensions. In 1975, when many older boomers had entered the workforce, 88% of private-sector employees had a pension. By 2017, that had fallen to 33%. And many plans were frozen with reduced benefits after 2006.7 Younger boomers are more likely to depend on income from a 401(k) plan, which places more responsibility on the worker for savings and potential retirement income. Less favorable Social Security benefits. While full retirement age (FRA) is 66 for boomers born from 1946 to 1954, it increases by two months each year for those born from 1955 to 1959, and reaches 67 for those born in 1960 and later. This not only means younger boomers have to wait longer to collect full benefits, but it also reduces benefit percentages at other ages because they are based on FRA. Also, boomers born after January 1, 1954, cannot take advantage of a strategy in which one spouse files a restricted application for spousal benefits while continuing to earn delayed retirement credits to increase his or her worker benefit. If you are at the younger end of the baby boom generation, this may sound discouraging, but every generation faces challenges. No matter how many years you have before retirement, it’s wise to take a clear look at your strategy and make appropriate adjustments to put you on solid ground when it comes time to leave the workforce. Securities and advisory services offered through Cetera Advisors LLC, member FINRA, SIPC. Cetera is under separate ownership from any other named entity. Providing college planning, financial planning and investment management services of the highest quality to small business owners, their employees and families. Securities offered through Cetera Advisors LLC, member FINRA/SIPC. College plann, financial planning and advisory services are offered through Prism Financial Group, a Registered Investment Advisor firm. Prism Financial Group, Inc. and Cetera Advisors LLC are not affiliated companies. We are licensed to sell Insurance Products in PA.